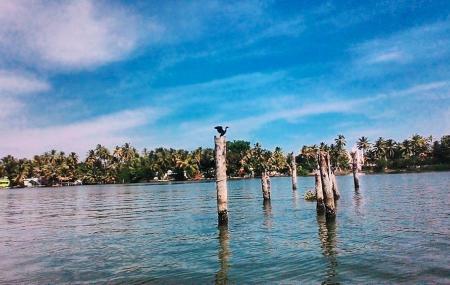 Alleppey is famous for its backwater. Adding to its charming beauty, Kayamkulam Lake has equally gained popularity in tourism. Though it located slight away from the city, this scenic backwater still manages to allure nature lovers. Spread for about 60 square meter, this shallow water lake is used for transportation of passengers and cargos. However, with its increasing demand in tourism industry houseboats has also been started to entertain the tourists. If you plan to visit this lake, come during sunset. With the lake’s wide open mouth towards the Arabian Sea and Chinese fishing net hanging around it, the lake looks majestic with the shinning twilight colour of the sun flashing on the water. The lake can be visited anytime of the day. How popular is Kayamkulam Lake? People normally club together Mannarasala Temple and Haripad Sree Subrahmanya Swamy Temple while planning their visit to Kayamkulam Lake. Very beautiful and apt for boating. But tourism is not well developed in around this area. The boat journey through the chines net fixed kayal is a immerse feeling. There is only a place to see is Lake palace and it's seems good but the backwater is full of garbages..